Don’t Stop Me Now - What makes you feel unstoppable? That Jesus has my back and I am never alone. Another One Bites The Dust - What one thing would you wipe off the face of the earth? Sickness such as cancer and also mental health problems. Under Pressure - How stressed are you currently? not too bad...I worry about Josh, but other than that, not too stressed. We Will Rock You - What was the last concert you went to? Hillsong United came to our church and that was an awesome concert! Somebody To Love - Are you looking for somebody to love? not romantically, but always looking for friends to love...or animals. We Are The Champions - What achievement are you most proud of? My son. I Want To Break Free - If you could move to any part of the world, where would you want to live? I would just want to stay in the U.S.A. If my mom were close to wherever I was, I would love to move closer to the ocean. Crazy Little Thing Called Love - Name some of your favourite musicians. not sure, I love so many different kinds of music and when I think of musicians, I think instruments...so I am just not sure. Even if we are talking about singers, I am not sure. Maybe Freddie! Fat Bottomed Girls - What are some traits you look for in a partner? Honest, smart, funny, easy to talk to, but a huge reason I married my husband was because he is a Christian and we share the same beliefs. I Want It All - If you could have anything in the world, what would it be? Since it has to be a "thing" I will say a new house. 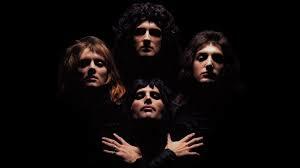 I LOVE Queen! I just want to listen to all of these songs now! The assurance of Jesus having it all under control is the best! I wouldn't have pegged you for a huge Queen fan, but why not? I like a wide range of music, too. Love your answer to the 2nd one! He is the best to have your back!! I love me some Queen too! Have a great Sunday! Finding someone with whom you share interests is a great basis for a relationship! We had many similar answers!! Faith and family are just so important! I really like Queen and these songs are all great! Fun questions this week and I enjoyed your answers! Queen is worth listening too at most any time. Hang in there with Josh. I agree that God and family are most important in life. Like you, I love Queen. A couple of weeks ago, I watched the movie, "Bohemian Rhapsody" on Netlix when it was available for the week after the Awards. I'd just forgotten how important they were in the scheme of things. Keep on truckin mama, truckin those blues away. It's really good to feel that there is some big bro out there that has your back. Several of the songs got stuck in my head, too.